Pictured here inside a paint hangar at Boeing Field in Seattle, Wash., the 7,500th 737 will be operated by Malaysia-based Malindo Air. 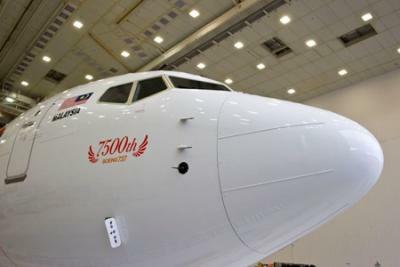 SEATTLE, March 20, 2013 /PRNewswire/ -- Boeing (NYSE: BA) has delivered the 7,500th 737 to come off the production line to Malaysia-based Malindo Air. Malindo Air is a joint venture by Jakarta, Indonesia-based Lion Air and Malaysia's National Aerospace and Defence Industries. Malindo Air is using the Next-Generation 737-900ER to launch its low-fares service. Malindo Air's 737-900ER (Extended Range) with the passenger-pleasing Boeing Sky Interior features new modern sculpted sidewalls and window reveals, LED lighting that enhances the sense of spaciousness and larger pivoting overhead stowage bins. The Boeing 737 is the best-selling commercial jetliner of all time with total orders exceeding 10,500 airplanes. Nearly 85 percent of Boeing's backlog of more than 3,100 Next-Generation 737s will be delivered with the Boeing Sky Interior.